The LongView enables you to extend the keyboard, monitor and mouse from your computer up to 500ft on a single Cat 5 cable, without the loss of signal. Allows you to move your computers to remote security rooms, server racks or simply out of the way. In addition to remote access, The LongView Companion also allows local access to the computer. 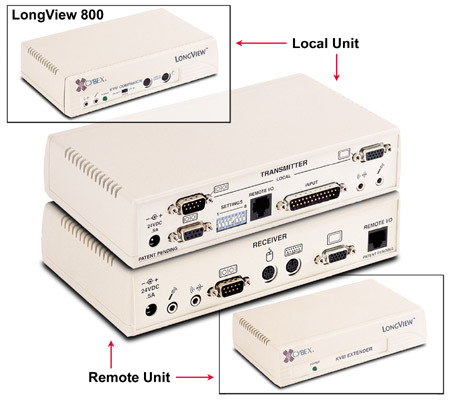 LongView is simple to install; no software or expensive networks are required. Just place your peripherals at your remote location, connect the cables and use your PC just as if it were in the same room. There are no jumpers or switches to configure. AutoTuning feature automatically optimizes and configures the Longview for your cable length, without user intervention. Keep your PC in a secure, climate controlled environment and still have access from crowded or harsh work areas up to 500 feet away! Using just one Category 5 cable gives you the additional benefit of lower installation cost and increased resistance to interference for high quality video transmission. Multimedia capability provides high quality PC audio and support for your PC speaker. LongView takes the worry out of system security. Place your system unit, software and sensitive data in a secure area to minimize tampering, system damage and unauthorized software installation. Compatible with other Dakota products that provide KVM switching and shared access.